For the past two years Lincolnshire based artists Lynn Baker and Jeanette Killner have been making work for an exhibition to be held at Sam Scorer Gallery this spring. Both artists have been visiting allotments in the county, drawing and taking photographs, each artist inspired to develop ideas in sketchbooks and further their work. Jeanette has made small, intricately constructed illustrations from metal, using techniques such as embossing and repousse, which show the cyclical nature of growing things: the annual rituals involved in the gardening year, from selecting seeds and cultivating a range of produce to the winter clearing up and digging, as well as pest control, compost and the all-important shed! Lynn has turned her attention to the ‘root’ of the matter. Her hand-blown glass ranges have been inspired by thread roots and the colourful array of bottles, compost bins and sheds. The colourful ‘characters’ that she met along the way are there too, albeit in the background. Jeanette and Lynn look forward to welcoming visitors each day to their exhibition and to sharing with them their thoughts and design work, and to discussing the techniques and processes behind their finished pieces. Each year the gallery welcomes artists who have new to Sam’s, for some artists this will be the first time that they have shown a selection of their work. This year 7 artists are joining us Alex Foxley-Johnson, Ali Hunter, Fionna Buck, Hannah Screaton, Helen McCarron, Rosie Ablewhite, and Samuel Randall, It is going to be a bright diverse show. 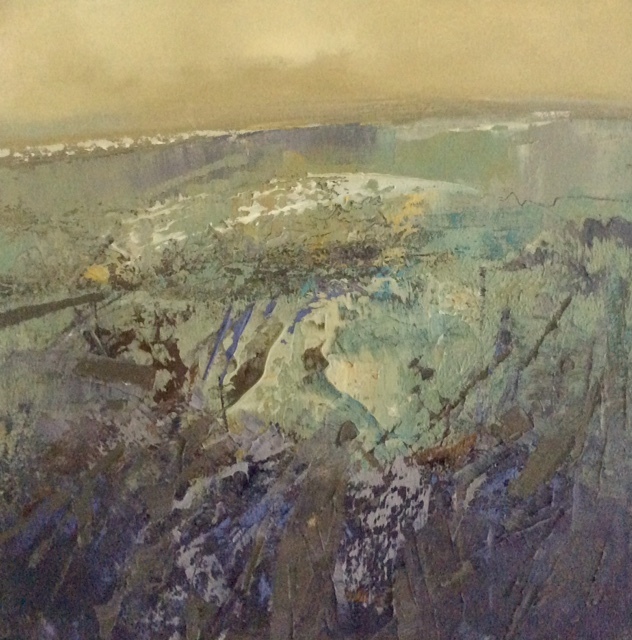 Homecoming is an exhibition of contemporary landscape paintings by Lincolnshire born artist Paula Hallam. Working in acrylics, she constructs complex layers of translucent paint to arrive at a desired destination. This collection reflects Paula's love of rural Britain and her evolution as a painter over the last three years." As part of her show Paula will be giving a short talk about her work at 2.30pm on the 9th March followed by a celebratory viewing of the show from 3- 5. The paintings on show represent nearly forty years of work . The subject matter and content of the work is simply about people , places and time . "Tempus Fugit " is the title of one of the paintings and the exhibition referring to a specific person my wife, the location is a small chapel in Italy and the time was early afternoon 2010. Thus time in this case is location and person specific . Painting for myself is just as much about what I do with my time and what I may become in the future as denoting my experiences. Painting allows me to objectify to some degree experiences in life since time can be so fleeting. .
We are delighted to offer you (and your friends and family) a superb range of workshops this February. Make time to join some great local artists sharing their skills. Join artist and model maker, Dale Wells, for a series of workshops aimed at starting you on the path to creating, and painting, your own miniature worlds. Whether you’re a seasoned modeller, or an absolute beginner, these sessions are designed to enthral and inspire in equal measure. In these workshops, you will create an intricate, card structure from household materials, a desolate waste ground, a brutalist rampart, and a mired pig! Whether you’re a hobbyist, an artist, or anything in between, come along and create some stunning works. Session 1: Putting together complex structures from simple card. Versatile, effective and essential for any modelling project. Session 2: Discover scale woodworking by constructing a highly atmospheric, dilapidated structure across a scenic base. Session 3: Learn how to inject character into foam board buildings with texturing, weathering and detailing techniques. Session 4: Add living creatures to your models with the aid of your very own wallowing pig diorama. All materials and tools supplied. Additionally, you will keep the finished piece and take home some suggestions for building upon what you have made! This workshop is aimed at the improve/ experienced painter. Lunch break 12-30-1 pm. No special equipment needed. Please wear protective clothing, eg, pinafore, overalls, and bring drawing equipment. Wed 13th February: Still Life Variations: This workshop explores composition and arrangement, drawing from still life objects and is suitable for beginners to the more experienced. From initial drawing and colour studies, create a single composition or several variations on the theme of composition, pattern and colour. Thursday 15th February: Thinking about Colour…: Sidestepping traditional colour theory based on the three primaries, this colour workshop explores some of the underlying principles of colour, transforming it from a haphazard affair into a thinking process. Suitable for beginners to the more experienced, create a series of studies from which to extend your repertoire and increase your sensitivity to colour. Please bring paints (gouache or acrylic), small brushes, mixing palettes etc. and paper. We will be creating collages using hand painted backgrounds (Ecoline - watercolour inks). For lovers of Art speak here is one for you! Phil Bowman and Tracey Smith will be 'Precurating' their Sam Scorer show in April during this week long residency. If you visit the gallery between 10 - 4 you can talk to Phil and Tracey as they are work on some of the larger paintings for the show,as well as see a preview of their show. 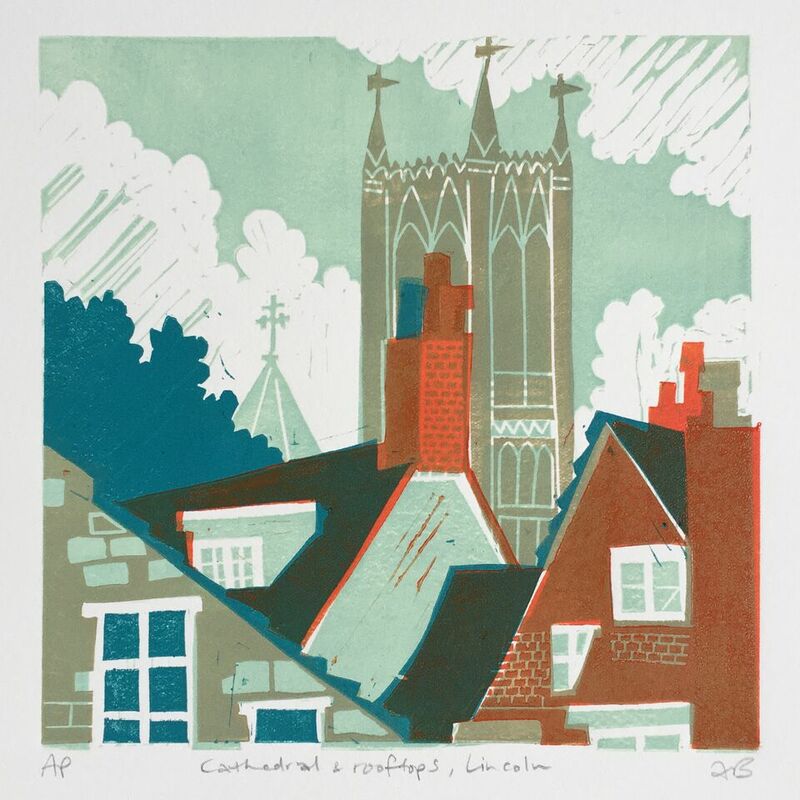 Welcome to the Inaugural Lincoln Print Fair… A new date in the Creative Calendar! An exhibition and a fair, rolled into one! - A space to buy and see incredible prints, showcasing well known artists, Turner Prize winners and a host of up and coming and established local artists. Come and see works by Tracy Emin, Turner Prize winners Jeremy Deller and Mark Leckey, British greats like Joe Tilson and Mat Collishaw and the recently arrested, eco campaigner, Gavin Turk. alongside wonderful pieces by international and other award winning artists. Darren Neave has curated the displays, he is perhaps better known as one half of ‘The Little Artists’… most famous for making Lego creations of Damien Hirst’s shark and Tracey Emin’s bed… He is also a recent Masters graduate from the University of Lincoln. Darren will be launching a cheeky new print edition, high-lighting the onslaught of growing old discracefully! Andrew Bracey is a Waddington based artist. From the heart of rural Lincolnshire, his work has been exhibited widely, in both the UK and abroad. He loves art books and his work employs a tension with ‘artful and respectful defacement’. His work is compelling and intricate. Joey Richardson; internationally renowned woodturner and sculptor, is a liveryman of The Worshipful Company of Turners of London and a scholar of the Queen Elizabeth Scholarship Trust (QEST). Her most recent work 'Distillation of Experiences', takes the form of a full sized, wooden shed, comprising of one hundred and twenty eight, pierced, detailed wooden panels, depicting poignant life events. Inspired by this artwork, Joey is now producing unique, ephemerally-embossed prints, bridging the gap between traditional and contemporary wood-cut processes. Other highlights will include DIY prints and a selection from the multitude of talents from the students at the University and invited artists and print makers. There are plenty of undiscovered talents, all of which push the notion of contemporary print making and reproduction. Milliners from all over the world have taken part in the 1st Lincoln International Millinery Competition Designs were themed on “The Four Seasons” and there were no limits on the materials that could be used for the creations. 27 Milliners from the UK, Europe, the USA, Canada, and Ireland took part and the submissions were judged by Parkin Fabrics, who supply millinery fabrics and materials, Guy Morse-Brown hat block makers/suppliers and Sharon Bainbridge, milliner and lecturer at Nottingham Trent University. You will be able to see all the hats in the gallery window from 18 December until the 7th January, so if your visiting Lincoln and particularly if it’s cold ,grey , windy , snowy and very seasonal ,they will give you a glimpse of colour, and the days when hats don’t need to me woolly! It is hoped that the competition will become an annual event, and with enough entries next year there could be a cat walk show as well. Annette Edger who has organised the event has seen similar competitions in Holland and Australia and is keen to promote millinery in the UK, particularly outside of London, as everything is centred on London and the south of England, putting Lincoln on the map in this profession. Rob Vashak, from his studio, “Studio Mitate” in North Carlton, Lincoln, produces a range of work predominantly in wood. The body of work being shown includes several pieces from an ongoing 5 year project “A Barn A Day” a range of forms inspired and influenced by the universally recognised concept of home. In this project I am creating a sustained body of work which reflects my personal creative development as a sculptor. Each piece takes on various forms and combinations of materials, all sustainably sourced and environmentally friendly. The work, a simple layering of stories both locates and draws in the audience as a witness, consciously and unconsciously connecting with the comforting concept of home, whilst challenging the disposable fragility of consumerism and populism in society. Using only sustainable materials Rob Vashak is interested in the Japanese concept of “Mitate” where objects are seen in a new light, often gaining a new life in a new form under a new purpose. Recycled materials and objects play a key part in my work. Rob Vashak moved to Lincoln 30 yrs ago following a successful career in design education. He studied Three dimensional design at Leeds University and has recently exhibited at the Manchester Museum of Science and Technology and Gallery Peix Vermel , Mallorca. John Holt, from his studio in Holmfirth began to search within an abiding interest in art and transformation by visually exploring notions of “flow and fluidity”. “Flow” as manifest physically in nature and psychologically in the process, the mechanics of human creativity. 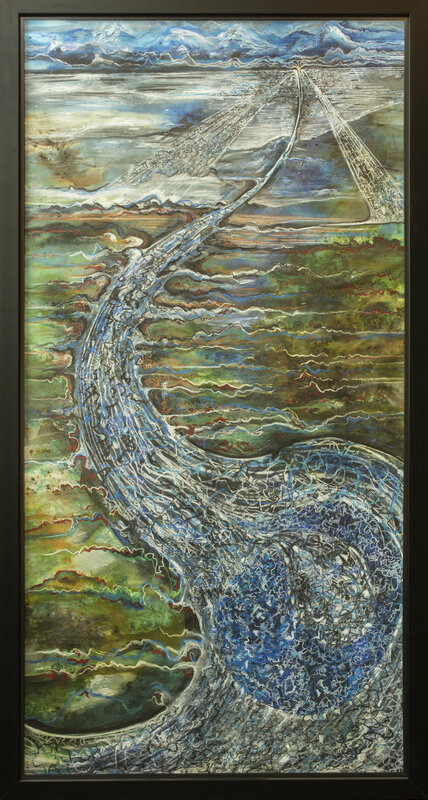 This work was developed in a series of large scale drawings, ceramic sculptures and in installations such as one in which I placed a series of seven ceramic sculptures into the flow of a fast flowing river and another working with a musician on an ongoing project entitled “Fragments of Lost Rivers”. These works took on a Taoist dimension. Taoism teaches a person to flow with life and to me this working process was concerned with placing oneself into the flow of life through art, to manifest a “creative flow”. The idea that the construction of language was an antidote to psychic fracture and disconnection from self was continued in my studio, just as I had always espoused in my work with students, patients and users of mental health services over many years. These visual maps of “flowing” I made in my studio are indicators of a search for a unity, of a psychic and a spiritual health and potentially of the true expression of one’s own nature. 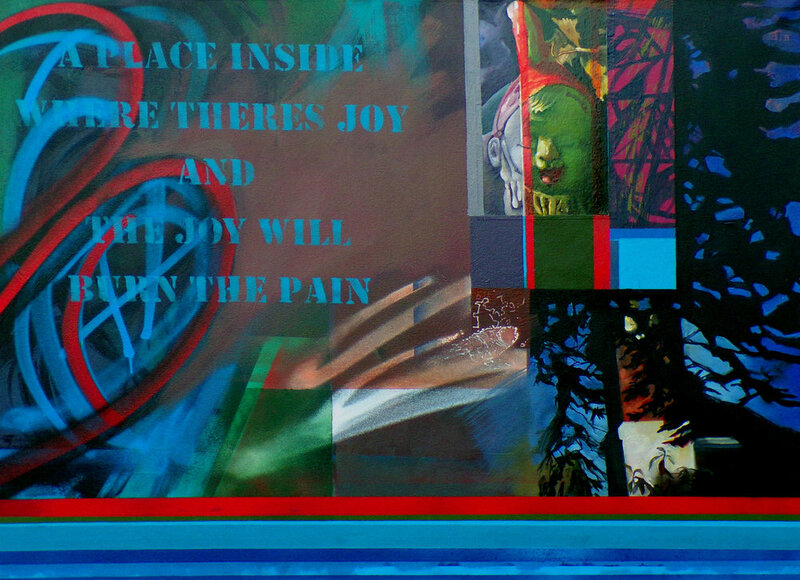 This work indicates the healing potential in art and it celebrates the power and beauty of the nature within us all. Featuring five artists (Lee Sass, Barrie Brown, Michael Wilson, Mark Steadman, and Andrew Taylor) who have either not shown in the gallery before or have only had one or two works in groups shows, its their chance to offer visitors a greater insight into their distinctive styles. Gill Vines and Rachel Rogers are two contrasting painters who share a love of vibrant colour and bold gestural mark making. They are connected by the need to explore, respond to and understand the world around them through their artwork. Sam Scorer is pleased to announce its First Open Exhibition! Featuring the work of over 40 artists in an array of different styles, many showing in the gallery for the first time. Although we won’t have any yellow walls, we will have colour! An exhibition by Caroline Christiane Matthaei - goldsmith and sculptor - and Wilhelm Schmidt - master goldsmith and watchmaker - of individually and collaboratively made work: simple automata, small sculptures, time pieces - on the common theme of mechanical movement. A tranquil addition to the show: watercolours by Johann Joachim Matthaei - architect. This exhibition showcases the work of six resident fine artists from The Ropewalk Studios in Barton upon Humber. The group have varied backgrounds and differing approaches to their work with a range of imagery that reflect the different stages of their respective careers – from recent graduates to not so recent graduates! The one thing they do have in common is that they all work on the banks of the River Humber under the shadow of the Bridge. The Artists are; David Alcock, Sally Beaumont, Emily Connor, Deborah Grice, Richard Hatfield, and Tim Needham. Private View, Tuesday 17th July 6pm – 8pm. “I’ve been out exploring in Yorkshire and Derbyshire, also my home city of Lincoln and nearby Woodhall Spa. Derelict scenes and details; captured by my imagination. Serendipity often takes me in another direction, this time, to a sub project of a remarkable scale! Jane will be in the gallery for the duration of the exhibition. Well known and respected local artists Denise Hawthorne and Anne Wood bring their new show to the gallery. Both artists have a love of the natural world but their expression of light, movement and colour is very different, but, complementary. There is an opportunity to meet the artists on July 3rd 11am-3pm and they will both be painting in the gallery on different occasions. The show opens on July 3rd and runs through to July 14th.The show will be closed on Monday July 9th but is open every other day from 10-4. The Lincolnshire Artists’ Society was founded in 1906 as the Lincolnshire Drawing Club. Members come from across Lincolnshire and while they work in a wide variety of styles and media, they share a strong creative passion. This year’s Summer Show brings together the work of 35 artists. 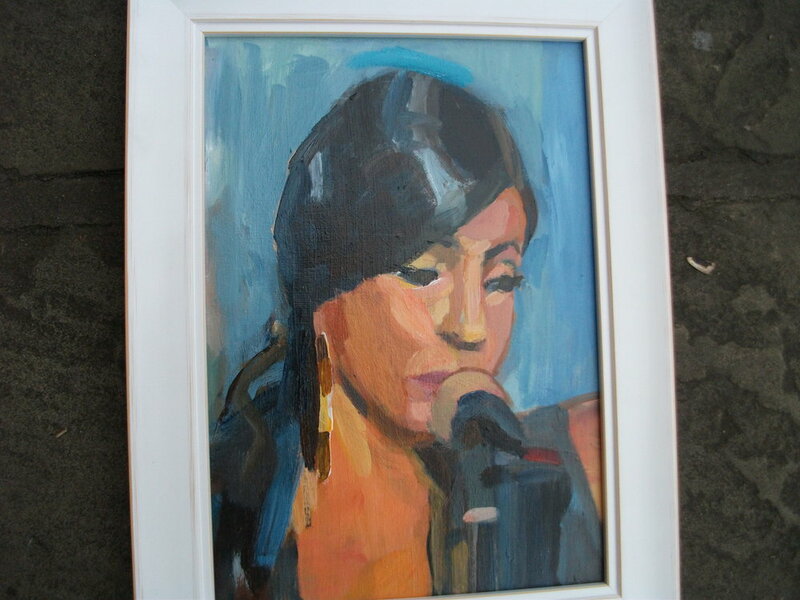 As well as a rich range of pictures there are inventive and original 3D works. Whenever you visit the show a member of the society will be there and will be happy to talk to you about their own work and the process of making, as well as sharing ideas about the exhibition as a whole. The show will be open every day from 19th June-1st July 10- 4. Since the Iranian Revolution of 1979, women have constantly found ways to rebel against restrictive laws. Natasha Monfared highlights this ongoing resistance by Iranian women through collage and sculpture. The role the mandatory veil plays within her work explores and questions its initial function in relation to a political weapon. Acting as a voice for these women who lack freedom of speech, Monfared aims to raise awareness of a fleeting moment of protest. How we perceive women in Iran may be stereotypical, but this begs the question: what is the source of this oppression? Show runs from June 5th-June 17th every day from 10-4. Ever wondered what happened to Lincoln College of Art students from the mid 70’s? They're back in town for a reunion and exhibition at the Sam Scorer Gallery at 5 Drury Lane. Former LCA students will be returning from all over the UK and even rural France to meet up and show their recent work, more than 40 year after they studied together in Lincoln. A wide range of art media will be on display, including photography, sculpture, painting, ceramics, fashion and textile design, jewellery and printmaking. Former students will be exhibiting alongside work created by LCA staff that taught them in the 70's. Show runs from 22nd May-June 3rd every day from 10-4. Inspired by Vergette's Time and Tide Bells Project on a beach near Mablethorpe. Stimulating conversations about people's relationship with the sea past, present, and future. Global warming and the social stresses a rise in sea level would bring. The exhibition will have works by German artist Felix Müller; some not exhibited publicly before. Müller's life is presented in counterpoint to that of migrants. Lisa Mitchell returns with her distrinctive photography. Leszek Dabrowski a popular exhibitor at the gallery will bring three new artists in a group show entitled 'Old Friend New Friends'. Elizabeth Seymour showing photography, Rob Vashak will bring three-dimensional work and Emily Cartwright will bring drawings and paintings. Inspired by the work of well-respected artist and teacher; Gill Nadin of Lincoln College, the Nadin Group show will bring a rich variety of mediums and styles from figurative to abstract works. Jaq McCaughern will be creating and working on a series of Angel panels for her upcoming exhibition at Lincoln Cathedral. Anyone interested will be able to watch them progress from bare panel, through drawing out, applying relief, gilding, painting and patinating. There will be opportunities for anyone who would like to work on an angel panel for themselves, discuss with Jaq. Anyone wishing to enquire is invited to contact Jaq on 01522539730 or 08725611251. A chance to see artist Jaq McCaughern at work in the gallery. Jaq will be taking over the gallery from Monday 22nd January, working on her wonderful relief panels for a show later in the year at the Chapter House. Jaq will be creating highly textural panels for her upcoming exhibition, “EARTH INSPIRED” at Lincoln Cathedral. Jaq will explain and demonstrate her techniques of painting in relief and explain her inspiration for this ongoing body of work. All will be welcome to pop in and chat about the work and the concepts underpinning it. 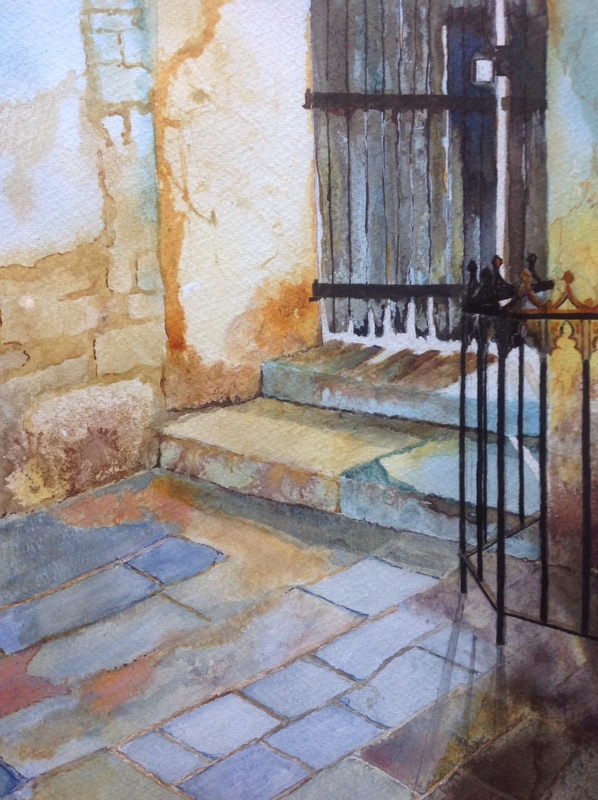 What happens when you paint over resist materials, add salt or cling film to your watercolour? Beautiful unexpected results can happen. Come and make your own expressive painting. Materials will be provided but if you wish to bring your own paints and favourite brushes please do so. Beginners welcome. natural world of fruit, seeds and spring flowers. Create a single drawing or a sheet of studies and get to know these natural forms through drawing their many shapes, forms, texture and colours. Please bring drawing materials and paper.